Growing peppers has become a very popular option among home gardeners. There seems to be an endless amount of pepper varieties, which include sweet and hot in numerous colors, make peppers a very compelling choice for the garden and dinner table. They are also very good for you. 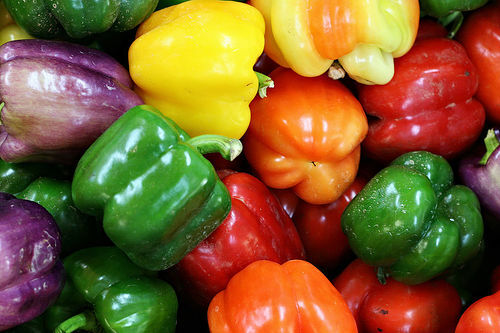 Peppers thrive on a little warmer temperature than many other vegetables, and must be handled accordingly. Another strength of the majority of peppers is they take up very little space in the garden and respond well to being grown in containers. Most varieties don't need much in the way of fertilizer to thrive either. Without question the bell pepper is the most used in America, as the great taste and color go well in everything from salad, omelets and any meal you want to add some color and flavor to. They also taste great raw. In the bell pepper category, you have some nice options for color, with some that start off green and as they mature turn to red or chocolate brown. Another one starts off purple or black and then transforms to red. You can harvest all of these at different times to take advantage of all the colors offered. Some bell pepper hybrids include Bellboy which turns from green to red; Purple Belle which turns from purple or black to red; and Chocolate Bell, which turns from green to chocolate brown. Another pepper I've grown is the Sweet Banana, which has a nice yellow hue that turns to orange to red. These are great in salads, or just about anything you may use a bell pepper for, although it has a more subtle taste. Other popular peppers frequently used in cooking are Tabasco, paprika and pimiento. Peppers can also be used as ornamentals because of their many shapes, sizes and colors. Hot peppers can really make the difference in some meals, adding a real spicy kick to them. Among those I've grown that most people could handle are cayenne, red chili and jalapeno. Another lesser known type I've grown was a tiny Thai pepper. That reminds me of a story when a young man came by the business and decided to test some peppers. He took a bite off a jalapeno he picked off a plant, and decided the heat wasn't too bad. He then looked at the tiny fruits of the Thai pepper and said he wanted to try one. I warned him because I knew how amazingly hot it was. But he would have none of that, as there was a group of people there and he was going to impress them. So he broke one off and took a bite, and in a matter of about second, his face turned pale white and he almost begged for a drink of something to assuage the heat. Suffice it to say, he never asked for any Thai peppers again. They were about an inch long and 1/4" to 3/8" in diameter. Many different ethnic groups have made the hot pepper grow in popularity over the last decade or so. Some hot peppers must be grown in specific varieties to be considered authentically ethnic for the meals they're used in. Flavors of hot peppers vary much more widely by variety than most people think, and have a dramatic impact on the cooking results expected for a certain meal. If you want hot peppers a little less hot, picking them earlier in the season will help, as the riper they are the hotter they get. Peppers aren't too difficult to start from seed, so you could do that in the latter part of the winter months, or wait to buy transplants at the local garden center or store. As mentioned earlier, peppers like a little warmer weather and don't tolerate a frost or cold, moist soil. A general rule of thumb to know when to plant peppers is when the night temperatures are hitting above 55°F or so. They grow extremely slow in cooler temperatures and can drop flowers and develop yellow leaves under those conditions. If you want them out earlier, black plastic mulch could be laid down to help warm the soil up and keep the plants a little warmer. Floating row covers are another option which produces a similar result. Since most pepper plants are fairly compact, spacing them from 18 inches to 24 inches apart in a row should be sufficient for the peppers. If you're planting them in beds, a little over a foot to 18 inches between pepper plants in all directions works well. 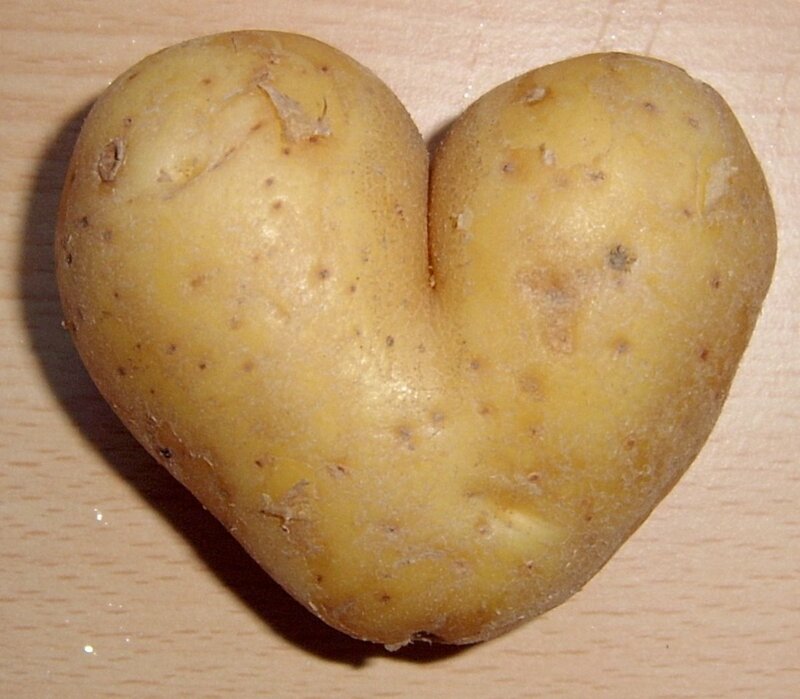 It's best to grow or look for a transplant that has a nice thick base that isn't too tall or leggy. Assuming about a 4 inch or 5 inch tall transplant, placing them about an inch down into the soil will do the job. If they're a little taller, compensate by sowing a little deeper. If you get heavy spring rains in your region placing them in raised beds goes a long way towards controlling moisture levels. Depending on why you're growing peppers and the size of your family, it really doesn't take too many plants to supply all you want to eat. A good balance it to have about 1/2, or maybe 3/4 of your pepper plants sweet bell peppers, with a salad plant or two like sweet banana peppers, and then a couple of hot peppers for spicy meal requirements. Of course it will be based on what types of meals you like to cook, so adjust accordingly, especially if you prefer or like ethnic cuisines. Peppers don't require a lot of care if you plant there where they will get plenty of drainage and in decent soil. In my experience you really don't even have to fertilize peppers too much as they'll produce pretty well without it. The peppers may not grow quite as large, but if they are plentiful and you've sown enough plants, that's not really much of an issue. You can give them a boost if you wish when you first plant them and another one when the peppers begin to set. You shouldn't have to do any more than that to get great peppers. Water is probably more important as it needs to be applied consistently and uniformly, especially as the harvest time approaches. You need to watch them closely during dry spells and be sure they are not allowed to get too dry. Peppers produce into the fall months once they start to bear fruit, so be diligent in watering them once that begins for superior results. Even so, they will slow down in how quickly they grow as the temperatures drop. If you're buying transplants, give them a good looking over to be sure they look really good. Don't buy pepper plants with stem cankers or spots on the leaves. Look for everything to be green and healthy. If you find those black areas that look sunken in on a pepper, that is called blossom end rot. There are several reasons this occurs in peppers. One is through cultivating in a way that gets too close to the roots of the pepper. Not watering the peppers on a consistent and uniform basis also caused this problem. Finally, a drought will result in blossom end rot on pepper fruit. Some of you that know blossom end rot is a calcium deficiency, but for those that don't, understand that it's not so much from the lack of calcium in the soil that blossom end rot occurs, but rather from the lack of the ability of calcium to properly travel throughout the plant. That's why adding calcium to the soil isn't a solution. Along with consistent watering, mulching peppers can help prevent the problem. The major disease problem for peppers is tobacco mosaic disease. If you smoke, someone around you smokes, or a smoker visits you, you or they need to wash your hands before touching pepper plants, as it can and will infect them. 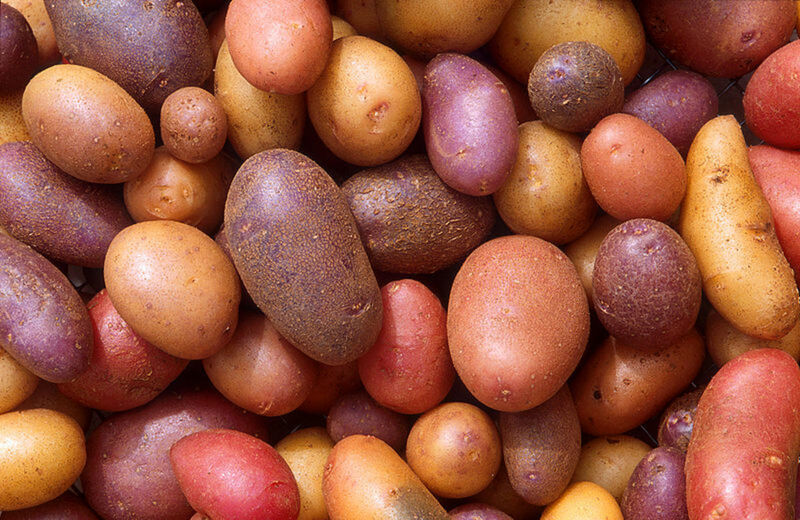 There are resistant varieties that can be bought to help manage the problem. While I've had an occasional worm burrow into a sweet bell pepper, they have been very few and far between, and not really a factor in fruit loss. Aphids on the other hand can be a problem for peppers, and you may have to use an insecticide to control them if they appear in significant numbers. If you suspect them but don't see them, another way of knowing there are a lot of them around is the fruit or lower leaves on the plant will have a sticky substance on them. You will need to take some action if that's the case. There is no trick to harvesting peppers, you can do it at any time for any size and any variety. That said, especially with bell peppers, most gardeners like to wait until they reach about 3" to 4" before harvesting. That has nothing to do with taste, but rather just getting more out of each one. Also with bell types that turn color, you'll have to let them grow longer in order to take advantage of the color turning. You can also pick them green to get some earlier peppers. When bell pepper fruits are more mature, they are also easy to harvest from the plant, although for the purpose of not doing the plant damage, it's best to use an implement to cut the pepper off rather than break it off by hand. On the other side of it, some bell peppers develop their color before turning to a red hue. With those you must pick them in a similar way as you would a green pepper before turning red. Some of those that color in immature states are those that are purple, brown, orange, white, lilac and yellow. Harvesting hot peppers is about the same as for sweet bell peppers, but you do need to be aware of a couple of things. First, a person should always wear rubber or plastic gloves when handling hot peppers. As much as you're able to, somehow remind yourself not to touch any bare skin while harvesting hot peppers, as it can result in much discomfort. More than once I've forgotten and rubbed an eye after harvesting cayenne or jalapeno peppers. It causes them to burn, in some cases very severely if you touch too deeply into the eye, ear or mouth. Secondly, hot peppers, for the most part, are best harvested when they have ripened red. But some recipes for green chilies require the fruits to be harvested when they're immature and green. The same rule applying to handling hot peppers when you harvest them applies when you're drying them: wear gloves and keep your hands away from your face. Another factor is when you start working with pepper pods. In that case you may also want to wear goggles and a good dust mask, especially after the period of drying is over and you're about to start crushing them. Finally, it would be best to crush your peppers outdoors if at all possible, or at least keep your windows opened to allow for the pepper dust to be released. Many of you have probably visited some place where you have seen pepper plants hanging upside down. What that is is peppers going through a drying process. What you do is cut your plant at ground level and simply hang the entire plant upside down in a dark, cool area. It actually takes about the entire winter season for them to dry properly. Although that's a slow process, it works really well for some peppers, including jalapeno peppers, because the moisture in the plants are retained which means they will be able to be used just like a fresh pepper, specifically for delights like poppers and stuffed peppers, among other uses. 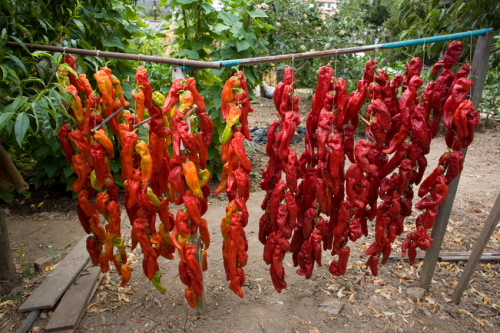 Another advantage in this drying method is the peppers will keep their color and flavor after being dried. You keep the entire plant in order to help with air circulations, which aids the process. 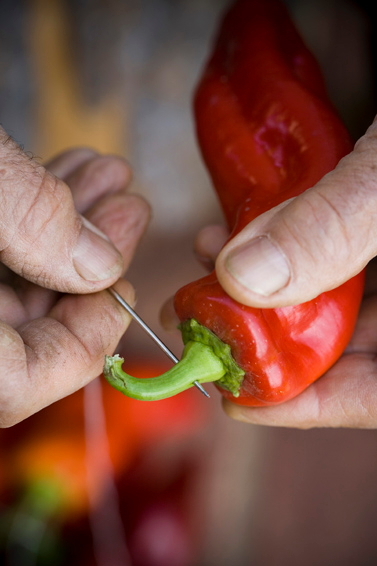 The key here is to be sure to keep the stems on the peppers when you harvest them, as they are where you sew into. You do this in a loose, not a tight manner, for circulation purposes. Best practices is to hang them in a similar location as you would the entire plant. But some people use them for decorative purposes in the kitchen and so hang them there to enjoy. I've dehydrated just about every type of vegetable and fruit there is, and peppers are a good candidate for this drying process as well if you have a dehydrating machine. With this method you don't want the pepper stems, so remove them before you begin. If you have elongated peppers or smaller ones, you could place them whole in the dehydrator, if larger, bell types, you may have to cut them. The dehydrator I have is a layered one, so they have about an inch or an inch and a half height to work with. Just lay your pepper - whether cut or not - out on the trays, but don't allow them to be on top of one another. If and when you cut the peppers, it's best to remove the seeds so they don't end up filling up the bottom of the dehydrator. Also place the cut side of the pepper towards the heat, with the skin part facing away from it. When you're dehydrating, be sure to have some ventilation in the room or the hot pepper fumes will permeate the area. For best results dehydrate your peppers at about 100 degrees Fahrenheit if your dehydrator has that capability. It usually takes a few days to get the results it takes using the hanging methods mentioned above for up to several months. If you want some of your large bell peppers or thick, longer peppers to be dried intact, then you may want to use an oven to dry them. Remove the stems but don't bother cutting the fruit, as the seeds won't hurt being in them, and it will have the same results you would have with them all falling to the bottom of your oven, resulting in quite a mess. Bake them at a temperature in a range of 100 to 150 degrees Fahrenheit. If you don't have a convection oven, leave the oven door open a little bit. This is for air circulation purposes. In order to have the peppers dry evenly, every once in a while turn them over. Let them completely cool off before taking any further steps. If your purpose of drying the peppers is to crush them into spice-sized levels, be sure to wear a dust mask, goggles and gloves. It will definitely kick up some dust. When you're finished crushing them place them in air-tight jars for later use. Dried peppers can also be stored as an entire fruit if that's your choice. All you have to do after drying them is place them in a large, air-tight jar or jars. When you want to use them simply soak them in water to rehydrate them and you're ready to go. Be aware that these rehydrated peppers won't retain the consistency of a pepper off the vine, but they can be used in numerous dishes and still taste great. If that doesn't get you wanting to go out and plant some peppers, I don't know what will. 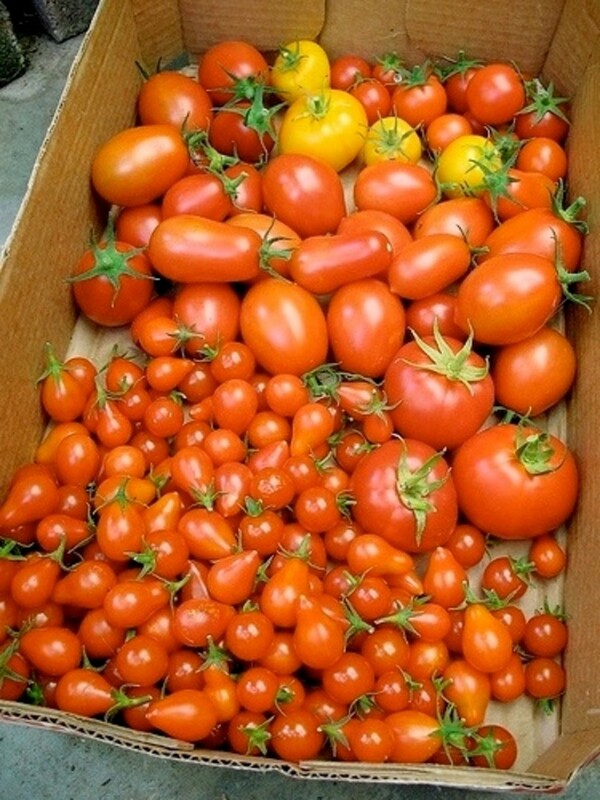 They are tasty, colorful, and can be stored for long periods of time if you dry them. You can even decorate you kitchen with them if you choose to dry them where they can be seen. The unique shapes and sizes add some great color and design to it. Add to that the relatively low maintenance needed for peppers, and it's no wonder they're growing in popularity and usage. I have planted some bell pepper seeds today. Thanks for the many information you shared. I have learned a lot. Something I learned the hard way is to plant sweet & spicy peppers far away from each other. If they're planted too close, they will pollinate each other and you will have a hybrid pepper that may be sweet, hot, or a mixture.